STENGLIN - ALEXEI I. – Alexei Michailowitsch zar i camoderschez wserossinskij (rossice). Alexei Michailowicz tzaar et autocrator totius Russiae. STENGLIN, J. - ALEXEI I. – Alexei Michailowitsch zar i camoderschez wserossinskij (rossice). Alexei Michailowicz tzaar et autocrator totius Russiae. ALEXEI I. – Alexei Michailowitsch zar i camoderschez wserossinskij (rossice). Alexei Michailowicz tzaar et autocrator totius Russiae. - STENGLIN, J. Title : ALEXEI I. – Alexei Michailowitsch zar i camoderschez wserossinskij (rossice). Alexei Michailowicz tzaar et autocrator totius Russiae.. Size : 13.6 x 12.7 inches. / 34.6 x 32.2 cm. 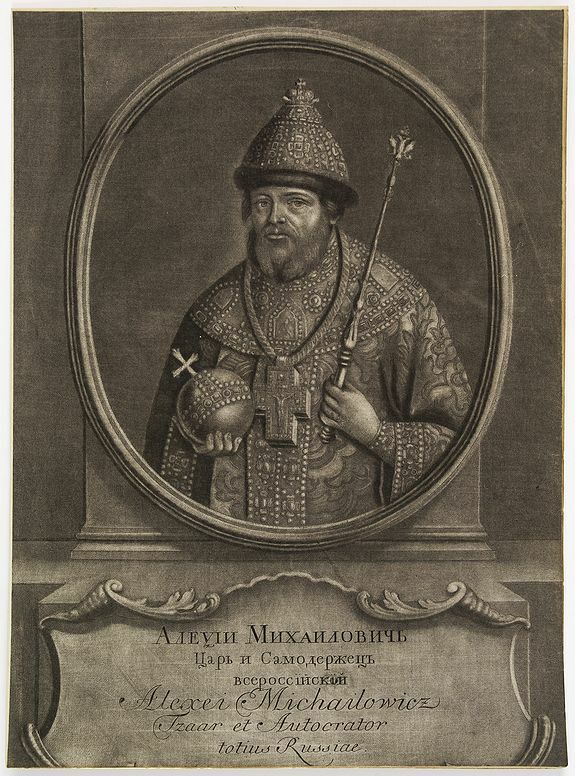 Description :Extremely rare half portrait print of Czar Alexei Michailowicz..
Aleksey Mikhailovich Romanov ( 9 March 1629 (O.S.) – 29 January 1676 was the Tsar of Russia during some of the most eventful decades of the mid-17th century. Alexei acceded to the throne at the age of sixteen after his father's death on 12 July 1645. Morozov was very unpopular however, regarded as a typical self-seeking 17th-century boyar, and was generally detested and accused of sorcery and witchcraft. In May 1648 the people of Moscow rose against them in the so-called Salt Riot, and the young Tsar was compelled to dismiss them and exile Boris to the Kirillo-Belozersky Monastery. Johann Stenglin was a well known engraver, bom at Augsburg in 1715, he studied under Bodenehr, and engraved after Dinglinger, Grooth, Haid, Klein, and De Meytens. In 1743 he received a summons to St. Petersburg, and engraved portraits of Russian Czars and members of the Royal Family. He died at St. Petersburg in 1770. Mezzotints poduced in Russia are very rare. Rovinskij I, N 21. Nagler XIX, 415.